My local river meanders either side of a narrow lane, often out of sight of the roadway, but with the leaves missing and undergrowth dying down, I was able to push my way through to a swim, that was new to me this afternoon. There was no path and I had to carry my tackle to the swim in stages over dead trees and and through a tangle of branches. Once at the river, I found a mudbank that was solid enough to support the tackle box, with enough head room to clear my twelve foot Hardy float rod. I could see leaves on the bottom and set up my 3 No 4 stick float to fish two feet deep with a size 16 hook to carry a 6 mm punch of bread. The restricted width increased the pace and I watched a couple of balls of liquidised bread break up into a cloud, drifting down toward a tree that had fallen over the river. 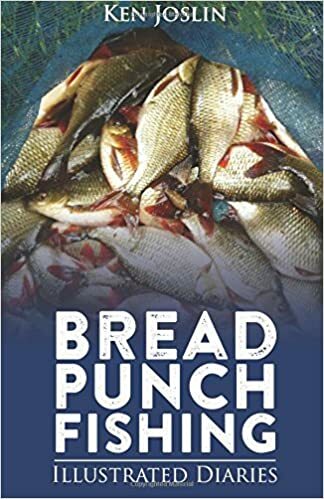 My first cast was not encouraging, the float carrying fifteen yards down to the tree before it disappeared, as a small chub took the bread. The soft action of the Hardy absorbed the initial run and the fish had its mouth out of the water by the time it reached the net. 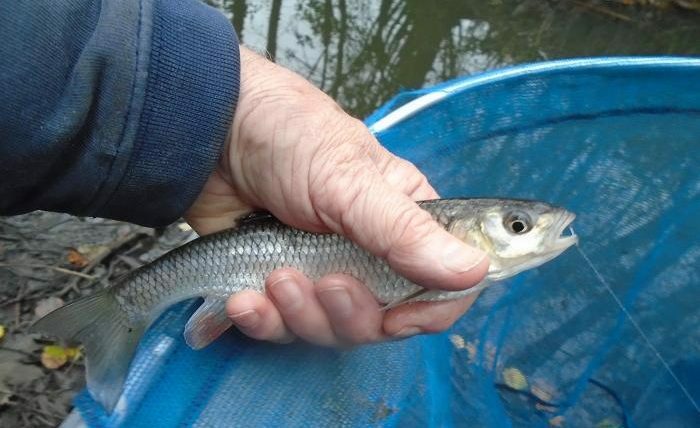 It was a cold day, with temperatures well in the single figures, but this chub was still cold to the touch. 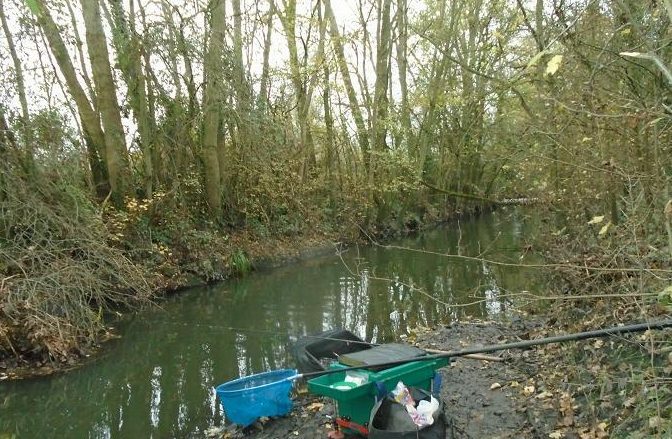 This little river is one of the best kept secrets in my locality, although not easy to fish, due to overhanging branches, it rarely fails to give an enjoyable few hours free fishing. 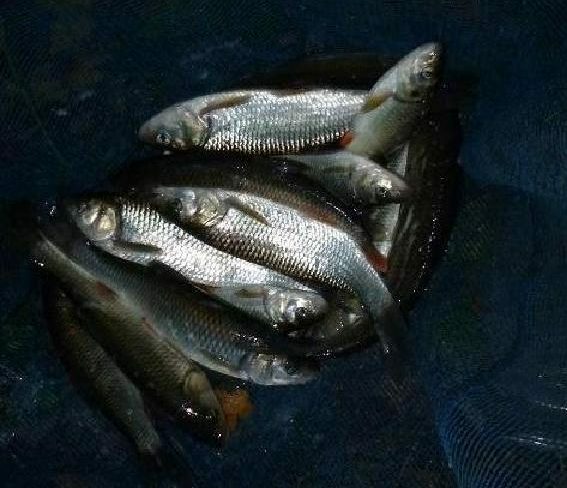 A couple of smaller chub followed, then another rod bender, as a better chub fought to find a snag beneath the tree, the rod applying just enough pressure to keep it clear, the net ready and waiting by the time it reached the mudbank. After swinging in another chublet, the next cast saw the float ease toward the fallen tree again, seeing it lift, then sythe across toward my bank, responding with a strike that pulled the rod down, and a rapid backwind of the reel. Beyond the tree, the fish was making a beeline for a large branch sloping from the bank into the water, but pressure turned it away. 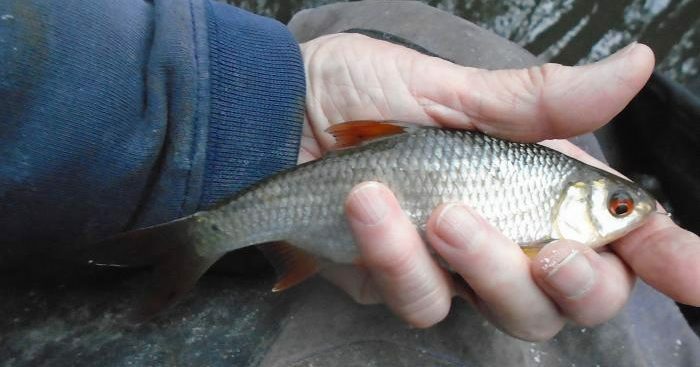 Soon the open, white mouth of a 2 lb chub, surfaced close to me and I reached down for the landing net, but the chub ran back downstream, before turning again to run back along the opposite bank. Unseen by me was a single frond of bramble hanging down into the water, the chub getting behind it to entangle the float. 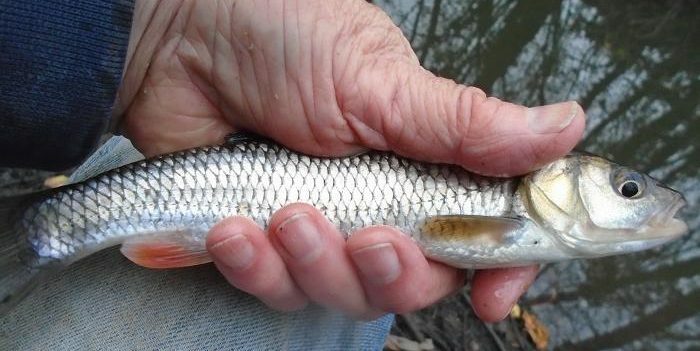 The chub thrashed on the surface and I pulled to free the line, breaking it. The float disappeared, then popped up close to the opposite bank. I now had to make up another float rig, changing to a reel with 5 lb line on it, the 2.8 lb breaking strain line OK on a snag free river, but here I had paid a price, the light touch of the thinner line, too vulnerable in these circumstances. While getting set up again, I fed a few more balls in to compensate for the lost chub, this time fitting a 4 No 4 ali stick to match the heavier reel line, the size 16 hook to a 2.8 hook link. Following down a ball of bread, the float bobbed, then slowly sank. Lifting the rod, I assumed that this float was fishing deeper, dragging on the bottom, but no, the juddering fight of a roach was welcome and I netted the first of several. 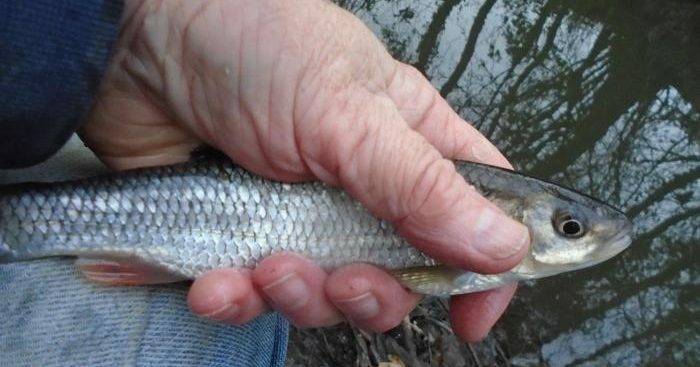 Small roach had moved over the feed, but the dithering bites were missable and I moved the float up another 6 inches to hold back, swinging the float down over the baited area. Holding back, I waited for the first tap of the float, let it run a foot, then stopped it again. Usually the float sank on the first release, swinging in a roach, or small chub each time, the bread crumbs now coating the bottom ten yards down. The better chub had also moved up, the closer takes requiring the lifting of my finger on the trigger, letting line free on the initial run, then lifting the rod to play the fish. A small ball of bread a cast kept the bites coming, mostly small chub, although the occasional better fish made it through to the end of the trot, fighting hard in the shallow river. The sun had gone down and it was now difficult to see the float under the tree, this last chub coming long after the float had disappeared from sight among the shadows, striking blind and making contact. Over the feed, I struck into a decent roach that ran down stream, then turned into my bank searching out the bottom near the end of the mud. 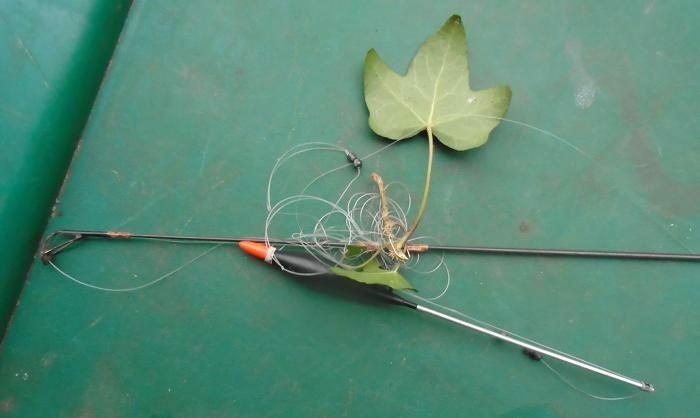 It found a branch on the bottom, transferring the hook. I pulled and it came free, only to fly up, getting entangled in a bramble. As a reaction, I flicked it back in time to see it wrap around the rod top. This was the end for me, having failed to put on enough layers, I was shaking with cold, my fingers in no shape to tie knots and pinch on shot. I’d had a good afternoon, despite the mini disasters, at least a dozen rod bending chub and enough small fish to keep the float going under.